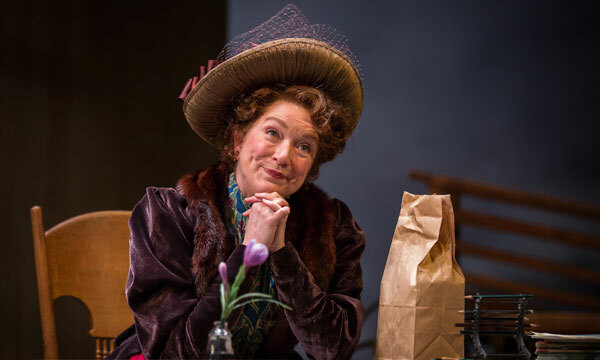 The Goodman Theatre’s “The Matchmaker,” a romantic farce directed by Henry Wishcamper, follows love liaison Dolly Gallagher Levi (Tony Award Nominee Kristine Nielsen) who plans to match herself with wealthy widower Horace Vandergelder (Allen Gilmore). Vandergelder has retained Dolly’s services to find him a suitable mate, and she takes every opportunity to secure her place by his side. The show is funny and joyous with witty monologues and great female characters for the period. Originally produced in the 1950s, Wilder’s comedy offered some valuable lessons on life, love and the ramifications of class divisions – themes still relevant to the contemporary world. This delightful version is rich with diversity and brings together a sensational cast which includes a transgender actor, several actors of color, and one actress with a disability. The play itself is inherently optimistic but mixed with a slightly dark underlying theme of desperation – some desperate to marry the one they love, some to fall in love, while others look to the future with only dollar signs in their eyes. Wilder was the most self-conscious of playwrights, and his intention to break down the fourth wall by periodically having his characters confide in us shows his versatility as a playwright. From Our Town to The Matchmaker, he never disappoints. The soliloquies are beautifully presented and work well because each element has so much conviction behind it. With inventive transitions, powerful acting, and gorgeous romantic sets (designed by Neil Patel), this show is not to be missed. The impressive cast also includes 2015 Jeff Award Nominee Behzad Dabu as Barnaby Tucker, Theo Allyn as Ermengarde, Sydney Germaine as Minnie Fay, Larry DiStasi as Cabman/Rudolph, Marilyn Dodds Frank as Flora Van Huysen, Marc Grapey as Malachi Stack, Anita Hollander as Cook/Gertrude, Ronobir Lahiri as Ambrose Kemper, Elizabeth Ledo as Mrs. Malloy, Ron E. Rains as Joe Scanlon and Postell Pringle as Cornelius and Ro.